Tales from Nobletucky: My BFP 4-Ever!!! OMP!!! I can hardly believe how lucky I am!! I have a BFP 4-Ever!!! That's right, a Best Friend Pug 4-Ever!! I am so excited about this!! I've never had a BFP before. What's even more exciting is that she was a friend of Lilo's too!! So last week, the momma walked in from work and told me I had a package. A package?? For me?? No way!!! Momma told me it was from my BFP 4-Ever AnnieBelly!!! Really?? AnnieBee sent me a package?? OMP!! How lucky am I?!?!? Momma opened the card and read it to me. She knows just how to make a puggy feel special!! Then I saw it! My new dress!! OMP!! It's so cute!! A great party dress. Momma and I are going to try and go to Vinny's 1st birthday party and this will be so perfect!! Don't you just love it!! Momma says we need to work on my modeling skills. Something about having the attention span of a gnat. Whatever that means! Maddie was SO jealous!! She just doesn't understand that she isn't the super model in the house!! I can't wait to wear my new dress!! Must have get momma to making plans for us!! I need to be seen!! Tata for now . . . . .
WOW ... your very own "BFP 4-Ever"!!! You are a lucky girl! And that is a beautiful dress ... I think you did a wonderful job modeling! Isn't it so great to have such good friends!?! Mia, darling, I think you look marvelous! You did a great job modeling too! Work it girl. A new outfit and a new friend. What more could you ask for? Woooo Woooo! Super sexaaaaay!!!! Love it! and how cool that you have a super cool bestie now! Mia, you are very lucky to already have a BFP - and what a cute dress!!! If you get to that party, you will be the hit of the party. Wow what a great double gift getting a BFP and a beautiful dress!! you look Bella!! 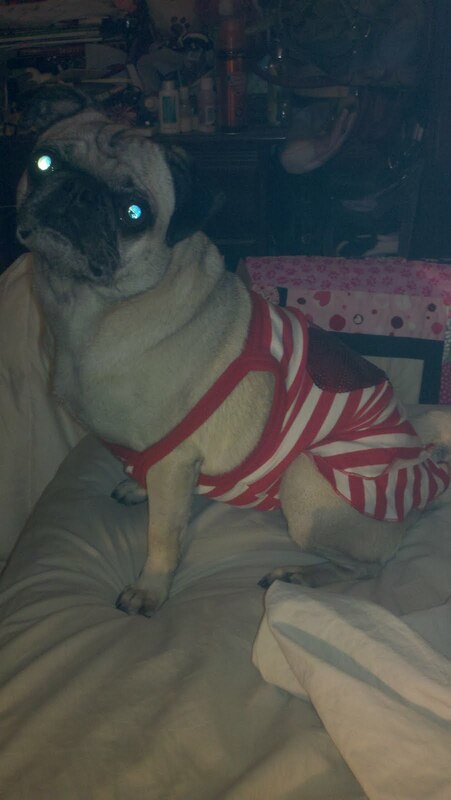 !totally America's next Pug model!!! You look pawsome in your dress. Must get your mama to get you a cheesy burger and a vanilla yogurt...a night on the town so to speak. Oh, Mia! I'm so happy for you, both because you have a new BFF and because you have one of the cutest dresses I've ever seen! You'll be the star of that party! How wonderful to have your very own BFP4VR! 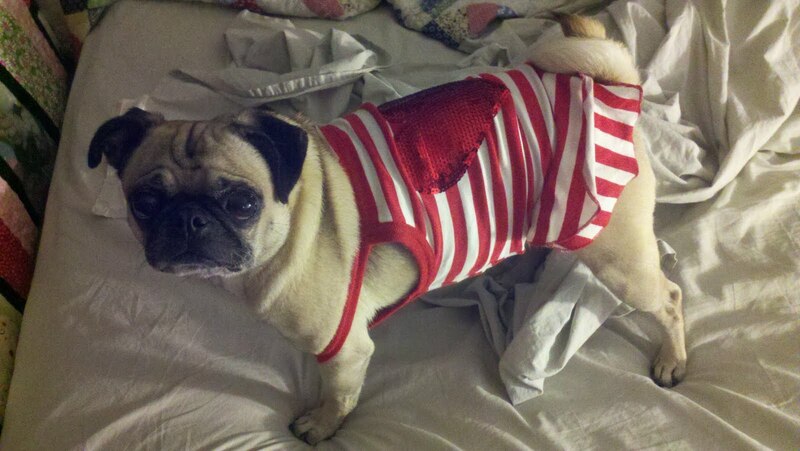 And not every pug can wear vertical stripes. You look fabulous, darling! Thank you for the lovely barkday wishes and for visiting my bloggy!! I just love your dress! And it came from Annie Bee- ? You are such an adorable little model. I am so happy that you have a forever home! Where have I been?! I did not know you had a new blog! I am going to follow now. Congrats on having your very own BFP! you look absolutely perfectin your new dress from annie bee! she always know the perfect fashions to get! you are so lucky she is your bfp 4ever! we love all of your photos!!! Hi Mia, nice meeting you! We just read your story. You are a very lucky puggie to end up with your momma! We know you'll fit in just right. Of course, I love your party dress! We are looking forward to following you and your adventures. PeeS; we agree, a girl is allowed to get growly from time to time! Great pics, bit it is so hard to read the blue writing on the white background! 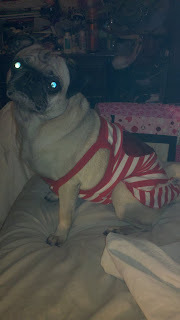 Dear Mia My BFP4EVR - this here is Anniebelly, Can yews believe mommy is JEST NOW reading me this bloggy post? *steam comes outta Annie's ears* I told my maw that she had better GIT WIDDIT and catch me up on your blog or else I would wet the bed. Ooopsie, did I say that out loud? That's our little secret, since we are BFPees4EVR, I gots a little problem that the doctor says pills will fix right up. 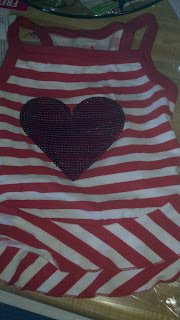 But enough about me - you look DEEVINE in your sparkly heart dress. It is sure to make all the boys fall in love with you and toss their kibbles at your feet.